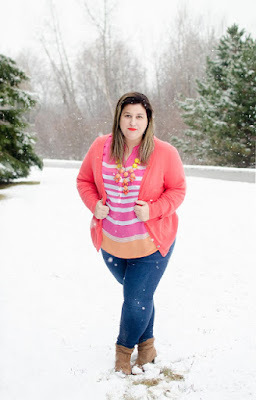 Nicole was the bright spot on a snowy day for all our readers!! How pretty are these colors on her? Hot momma! 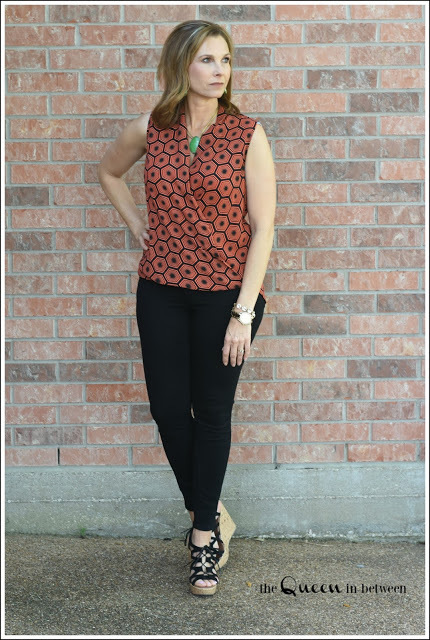 The ever stylish Shelly rocking a beautiful geometric pattern blouse! Make sure you linkup at the bottom of this post for your chance to be featured!!! Okay, now down to business... let's get colorful! Prior to about 2 years ago the only color of pants I would wear were: blue (denim only, not actually blue pants) and black. You would never find me wearing white (that's still touch and go with the littles) or any other color on my lower half. Then, on a whim, I bought a pair of orange (yes, you read that right) capri pants. 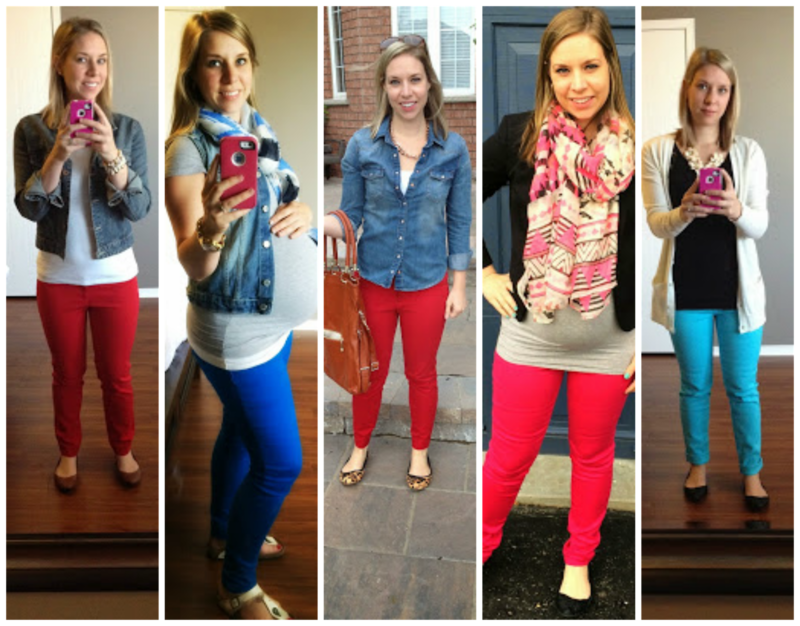 They were on sale (score) and fit like a dream... my love affair of colored pants began and the rest is history. I'm here to help you see the light bright. 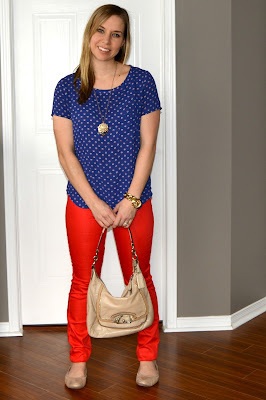 Pants with some color are a great way to add some some variety and fun to your wardrobe. Colorful pants can be a little bit of a challenge to style, especially for us somewhat style-challenged folk. 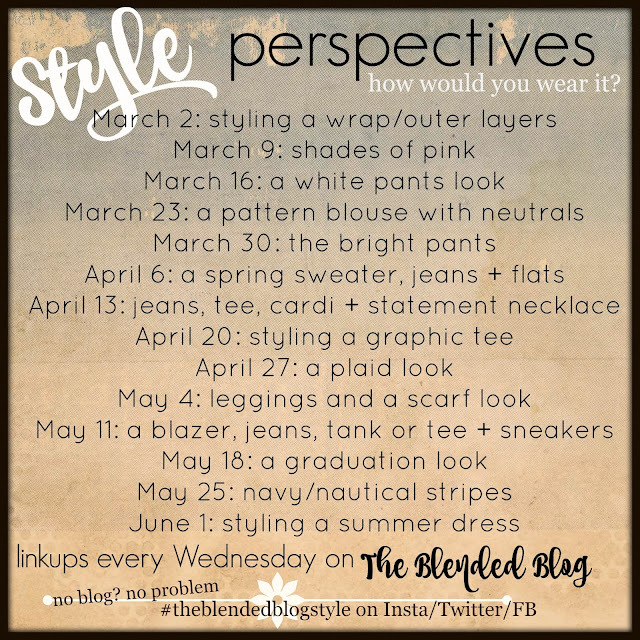 Obviously neutral pairings are a good choice (black, white, denim etc). But, that's not the only way. 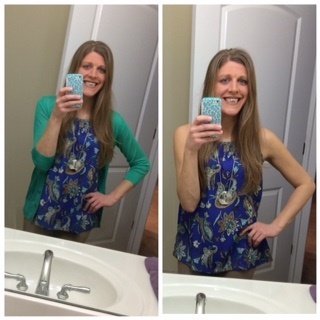 Try pairing them with other brights! I mean, why wouldn't you want to look like a giant bag of Skittles? Taste the rainbow? I say wear it! Sure, you may need to avert your eyes for a second, adjust the brightness on your screen or find your sunglasses quickly, but seriously, try looking at this outfit and not feeling a little bit happier. Okay, maybe that's because you think I resemble a clown, but clowns make people happy, no? Well, I suppose not if you're one of those people who are afraid of clowns. Now that I think about it, they are quite creepy. Too late, pictures taken. Flowers, I remind you of bright spring flowers. Better? Whew. Sorry about that. I feel kinda like I'm walking on sunshine in this. It makes me happy. It's like a Spring day. Okay... maybe a little overboard, but you get it. When I'm seriously rocking my mombie status, wearing something like this makes the day a little bit easier, a little bit more cheery and I'm always down for that. here's a fam-jam shot for ya, purple pants for the win! 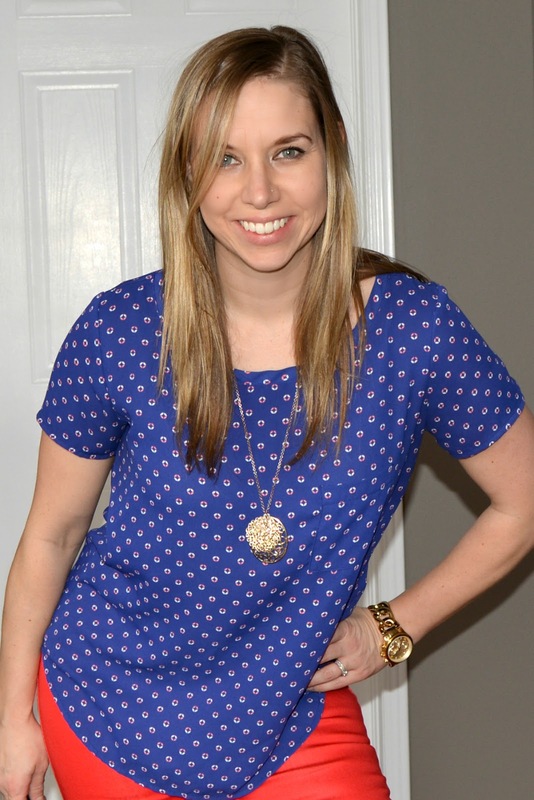 So the next time you wake up on a dreary day, throw on a pair of bright pants and a coordinating bright top! You won't regret it. At the very least, you might make someone else's day a little brighter (literally) and that's cool too. Want more? 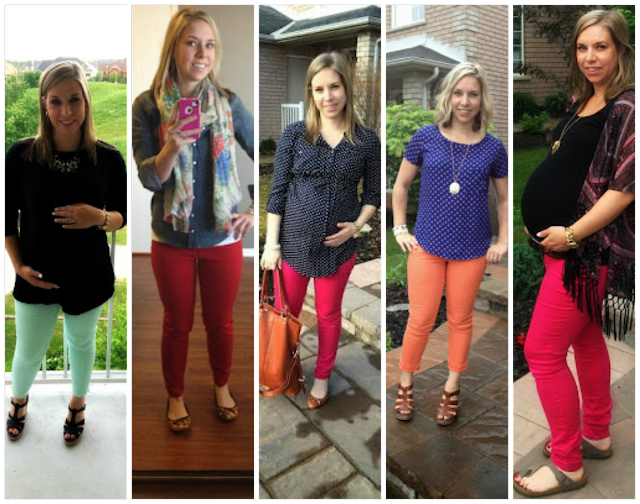 see all my colored pants looks HERE! Are you already a bright pants lover? 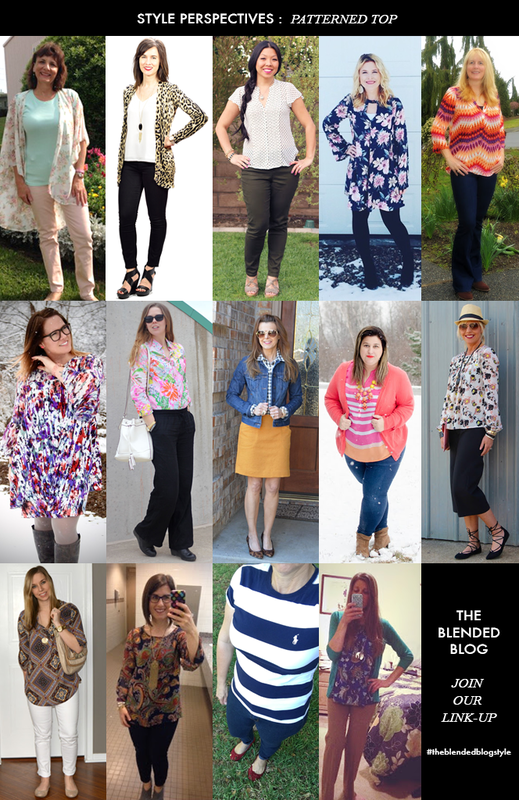 Yes - linkup your bright pants posts below! If not, have I convinced you to give them a go?